Agile scrum methodology is one of the most commonly used practices in project management in today’s time. The benefits that the method comes with such as increased business value, faster go to market, greater transparency among the team, and better quality management is enough to push a number of business across a range of industries to follow the Agile Scrum approach in their everyday work process. If your business, seeing the benefits that the methodology has to offer, is also planning to take the agile scrum development route, this article is for you. Before we move on to the factors you need to consider before adopting agile scrum methodology, let us first touch bases on what Agile Scrum Method actually stand for. 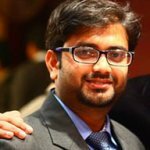 What is Agile Scrum Method in context of Mobile App Development? Scrum is the most commonly used sub domain of the agile methodology, which has quickly expanded to handling big, complicated projects that might have otherwise taken a lot of time to finish. Used mostly by mobile app development companies or software based agencies, the scrum team break down their allotted work aka product backlogs in actions, which they could cover within the two-week cycles, also known as – “sprints.” By the completion of every sprint, the team is expected to produce a working mobile app, which they continue to work upon and improve. Product Owner – Is responsible for overlooking what the team is working on and is also responsible for ensuring that the backlog is up to date. Scrum Master – Is assigned to ensure that the agile scrum is followed rightly by the team. They are also responsible for overlooking how the team is performing and then resolving any issue that is coming up. Scrum team – They are the ones who are actually doing the tasks. They own the development and testing part of the whole project. Handled by the product owner, product backlog is a list of tasks that the team needs to perform. The modifications and priorities are set as and when needed. The idea is to have a list of backlogs ready before the sprint starts. In this step, the mobile app development team decides on the backlogs they will be targeting on in the current sprint. Sprint backlog is the list of things the team plans on achieving in the delivering. Usually, sprint backlogs are divided into workable actions and once the team agrees upon the backlog items, the sprint begins. Once the team start working on the product backlogs, a practice called daily scrum is initiated. A stand up daily meeting is held every day for 15 minutes. In the daily scrum everyone in team tells about the last day’s work and the day’s plan. The daily scrum lets everyone in the team know of the whole project’s progress. After every agile sprint, the team demonstrates what was developed to the stakeholders and look into the steps where they got stuck and which went well. The findings of one sprint becomes the action statement of the next. The end result of a scrum is called Increment. The aim of everyone involved in a scrum is to deliver an increment that is complete on its own.It should adhere to all the quality standards set by the product owner and team. This entire cycle is repeated in the next sprint. Sprint Planning chooses the next set of items in the Product Backlog and the sprint cycle starts again. As the team executes the Sprint, the Agile Product Owner simultaneously ensures that the items which are on top of the product backlog are executed first in the next Sprint. The short, iterative cycle offers the team a lot of opportunities for learning and improving. How Does Agile Scrum Methodology Makes Mobile App Development Efficient? 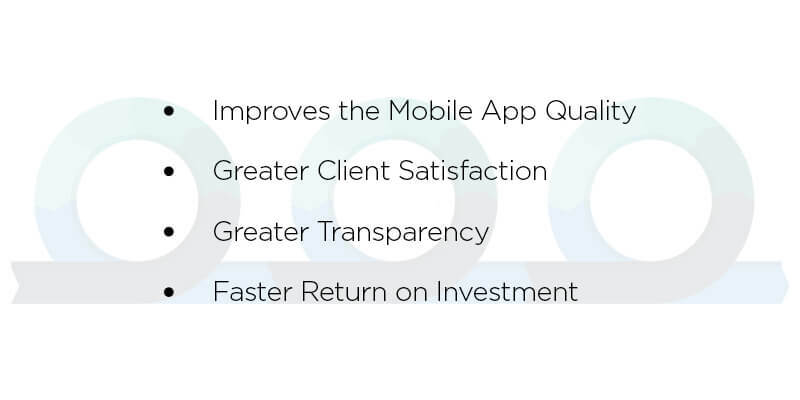 Since testing and QA is integrated at every sprint throughout the agile process, the app is checked at all stages, ensuring that it is developed according to the set quality standard, thus sealing its future in terms of high performance and acceptance. Since Agile Method is based on involving the clients at every point, they have a clear access of the app progress, as they are given an app demo with every set of newly added features after every sprint. Since the practice of agile methodology is based on involving everyone who is a part of the mobile app development process plus the client, everyone knows the exact work that is to be done and its status. One of the perks that come associated with Agile methodology is Faster development and ROI. with the help of Agile, companies are able to start the development process much faster, and are able to take up multiple areas of the process at the same time. Add this with the ease of testing the app function by function on the go, and you will get an expedited app development timeline. Now that you know what agile scrum development methodology stands for and what its benefits are, let us now move on to the factors that you need to consider before you adopt it in your mobile app development branch. 1. Do you have a person in your team who can fill in the role of a scrum master? Before you even move on with the Agile scrum methodology, you will have to appoint a scrum master who would be overlooking all the development processes and the challenges that the team faces. The scrum master will be responsible for gathering requirement from the stakeholders and getting inputs from the end users. He will also be responsible for holding the scrum meetings and managing the backlogs. The role of a scrum master is a very crucial one when it comes to development using the Agile methodology. He would be single handedly responsible for the easy completion of the project. 2. Is your team’s role and responsibilities clear? The success of your mobile app development process based on agile scrum development methodology depends entirely on how clear your team is with the roles they have to play and how willing they are to handle their part independently. If the individual team members are not comfortable with their roles, the project will face a number of execution challenges and you will never be able to take the full advantage of the agile scrum methodology. 3. Will the Agile Scrum Method actually work for your industry? Even though Agile Scrum method is used by a number of industries globally, it is not fit for all the industry types. 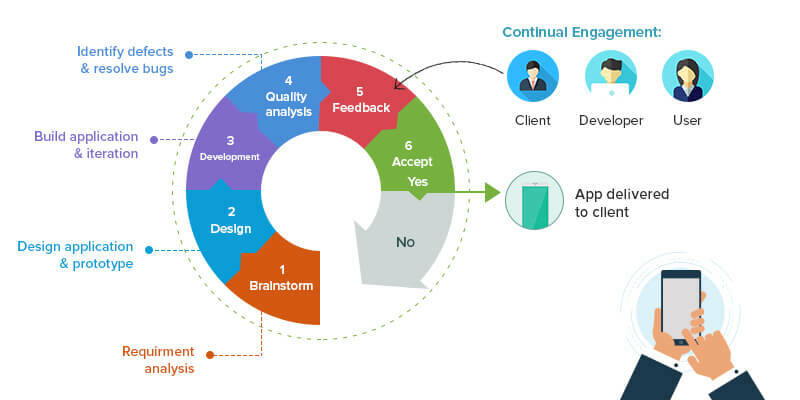 The development method works best for small size teams who handle projects with unknown solutions, varying deliverables, and constant interaction with the end users or clients, which makes it ideal for projects that deal in marketing, software development, supply chain silos, or strategic planning. Processes like accounting, sales, and even the purchasing domain, which deals with established processes or static deliverables won’t really benefit from it. In the end, if you understand the benefits that agile scrum development methodology will bring with it and you are prepared to change your work process around it, go ahead with it. But ensure that you have got your stakeholders and team on board with the idea.